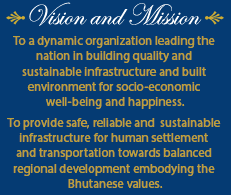 The key objective of the Division is to provide safe and affordable water, adopt measures to combat the impacts of climate change on drinking water, protect environment and health by establishing sustainable waste water and solid waste management systems in every Bhutanese town. •Ensure, in collaboration with Municipal bodies, access to potable and adequate water and sanitation facilities in consolidated and cost-effective manner through provision of sustainable eco-efficient water supply and sanitation infrastructure in Thromdes. •Ensure equitable, efficient and functional water and sanitation systems in collaboration with Municipal bodies. •Develop institutional and management capacity at local levels for the sustainable delivery of improved water and sanitation services. •Provide professional services to the Municipal Corporations/Dzongkhags/External funded projects for the development of water supply and sanitation infrastructures.